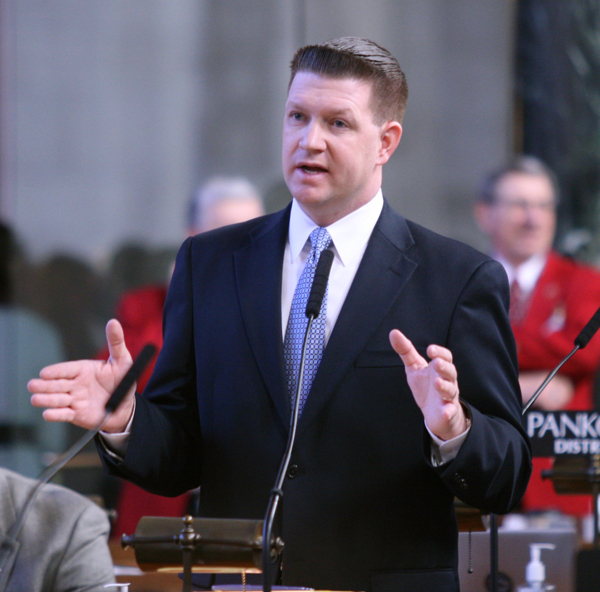 Lincoln, NE – The bill is sponsored by Sen. Mark Christensen of Imperial. It says if the Department of Natural Resources prohibits farmers from using surface water for irrigation, it should provide them reasonable compensation. “Its about half of what it should be,” said Christensen. “I’ve got a lot of very unhappy farmers that I’ve been that aggressive on limiting the amount, but at the same time I’m working with them to say, y’know, we’ve got to work with the state we’ve got to keep the state in compliance, and we also have to meet our obligations,” said Christensen. “Until we address the problem, we will have every year somebody coming back to the Legislature to say ‘I didn’t get to use water,” said Lathrop. “Somebody needs to pay me because I didn’t get to use water. My water, the water I would have irrigated with, has to go down to Kansas. So somebody needs to pay me,” said Lathrop. Lathrop said he hopes to amend another bill later to allow the state to determine if water in the Republican basin is over-appropriated, which would give it more management authority. Senators then gave the bill first round approval on a vote of 27-0. On another matter, senators gave first round approval to a proposal to study the effect of climate change on the state and make recommendations. The bill was sponsored by Sen. Ken Haar of Malcolm. “My bill deals with climate change,” said Haar. “It’s here, it’s happening, and we will have to adapt. What LB 583 comes down to is what does science tells us long term so we can plan and we can adapt?” said Haar. “I for one – this is a philosophical position – don’t subscribe to global warming – that theory. I think there are normal, cyclical, rhythmic climate changes that are not caused by man-made attempts,” said McCoy. McCoy succeeded with an amendment inserting the word “cyclical” before climate change. The bill calls for the state’s existing Climate Assessment Response Committee, which studies drought, to report by Dec. 1 of next year. It advanced on a vote of 35-0.